Old Time Pottery Takes Us Back To Those Wonderful Years And Times Gone By. 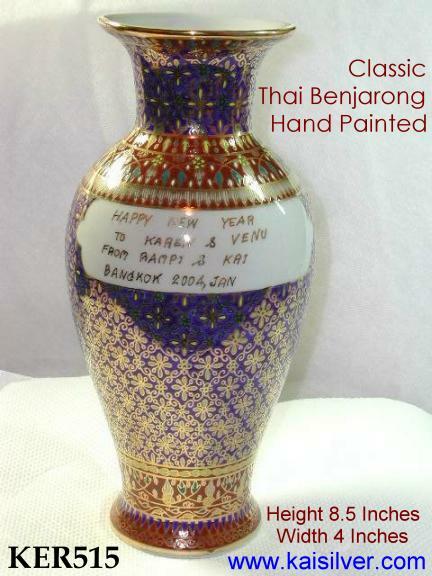 Benjarond Would Be A Classic Example Of Old Time Pottery With It's Origins In The Royal Palaces Of Thailand. With Customization For Benjarond From Kaisilver, You Select The Shape And Design For Your Pottery. Then, Add That Personal Touch With A Message Of Your Own. Create The Perfect Gift For All Occassions Mother's Day Gifts, Birthday Gifts, Valentine's Gifts, Wedding Gifts And Gifts For Any Other Occassion. Customized Old Time Ceramic Pottery (Benjarond) With Your Message Even For Single Piece Orders. Benjarond Pottery Is Created By Very Skilled Artisans. Today Benjarond Would Easily Rank As One The Top Examples Of Old Time Pottery. Kaisilver Is The Only Seller To Provide Customization Even For Single Piece Orders. . The Reason Why Good Quality Thai Benjarond Is Hard To Find Is Not Because Of The Lack Of Popularity Of Benjarond. Like All Old Time Pottery, The Lack Of Dedicated And Skilled Craftsmen And Artisans Has Limited The Supply Of Good Quality Benjarond Ceramic Pottery. There Is Only One Way Of Making Good Quality Old Time Benjarond Pottery. The Process Is Time Consuming And Requires Continous Attention From Very Skilled Artisans And Craftsmen. It Is The Quality Of Production That Makes Your Benjarond Long Lasting And Also Keeps It Looking Bright And New. Click Here For More Details High Quality Standards Are Followed Right From The Process Of Making The Basic Ceramic Bowl Or Vase To The Intricate Hand Painting On The Surface. Our Benjarond Thai Pottery Is Baked In An Oven At Temperatures Of Over 500 Degrees Centigrade, And This Is Done At Least Twice During The Production Process. Any Pottery That Does Not Withstand The Intense Heating Process Is Rejected. No Attempt To Cover Up Flaws In The Next Phase Of Production Is Attempted. Select The Shape And Design For Your Custom Benjarond. Choose The Message. Single Piece Orders Welcome. The KER515 And KER517 Old Time Pottery Benjarond Designs, Are Priced At Just 250 U.S$ Per Piece. You Can Ofcourse Choose The Design Of Your Choice For All Benjarond Ceramic Pottery On Our Web Site. 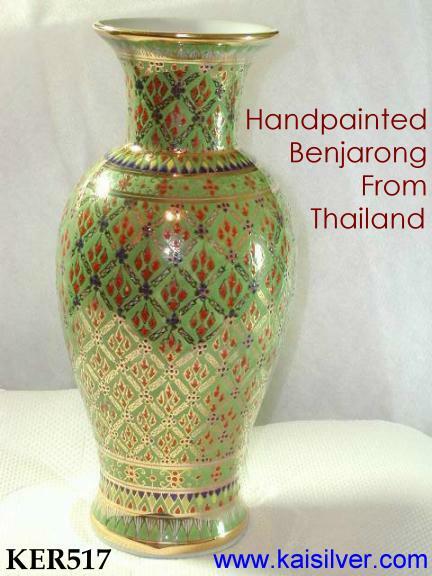 Benjarond, One Of The Finest Examples Of Asian Pottery Has Been A Tradition In Thailand For A Few Hundred Years. The Number Of Dwindling Artisans And Craftsmen Practising The Benjarond Art Has Resulted In An Extremely Small Volume Of High End Produce Reaching Local And International Markets. Kaisilver Now Provides High End Customized Benjarond Old Time Ceramic Pottery. With Strict Quality Control Checks At Every Phase Of Production And A Dedicated Team Of Craftsmen And Artisans We Provide Customization And Personalization Of Your Benjarond Orders Even For Single Pieces. You Select The Shape And Design To Create A Unique Thai Benjarond Ceramic Pottery Piece. Note Down The Item Number Of The Shape That Interests You, Next Select Any Benjarond Design From Our Website. You Can Even Personalize Your Ceramic Gifts With A Message. If You Need A Custom Message Painted On Your Thai Ceramic Benjarond Pottery, Let Us Know The Moment You Place Your Order. Keep The Message At Around 15 To 20 Words Split Into 2 Lines. This Is Fine With Ceramics That Are At Least 8 Inches High. For The Pottery That Is Around 5 Inches High Limit Your Text To 8 To 10 Words Split Into 2 Lines. This Customized Message Will Be Painted In Gold Color On The Old Time Benjarond Ceramic Pottery And Will Be A Part Of The Design. Incase You Need To Select A Font For Your Personalized Message See The List Of Fonts Available. The Font Shown On The Image Above Is The Natural Handwritten Font. 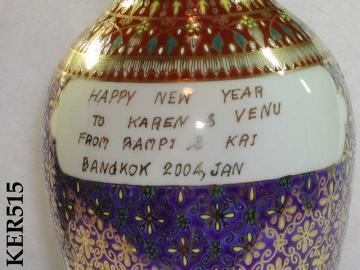 Click For Font Options Email Us The Above Details At sales@kaisilver.com We Will Get Back To You Very Soon And Provide All Details For The Benjarond Ceramic Pottery From Thailand. Kaisilver Will Then Create The Most Spectacular Custom Made Bencharon Ceramic Gift Pottery For You, Along With Your Personalized Message. Complete Customization Is Possible Even For Single Piece Orders. You Really Do Not Need To Place Bulk Orders To Have Your Benjarond Ceramics Customized.